Now that you have created a new repository you have to supply it with some version data. GitHub provides many ways in which you can supply version data, which are helpfully described on the page given to you when you create a new repository (as seen below). We are going to use the third of these options, which is to push the version data from our local versioned_dir directory into our cloud versioned_dir GitHub repository. To do this, we need to tell Git running on our local machine, that it needs to use our GitHub cloud repository as a remote repository. This is achieved using the git remote add command. 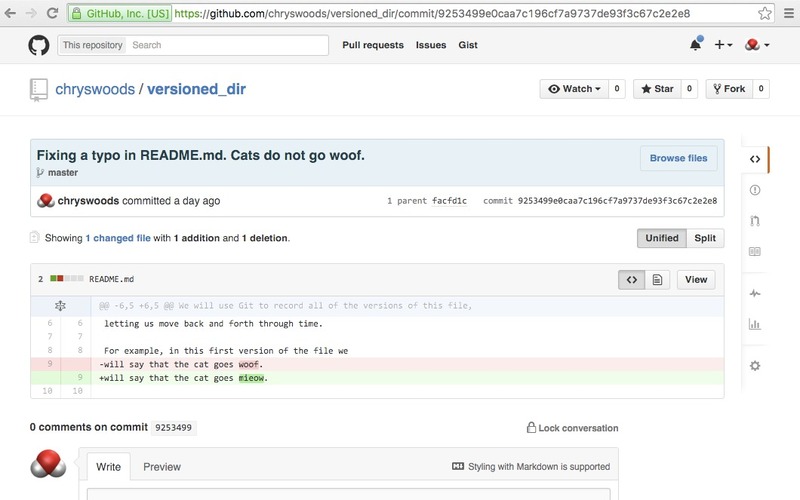 Use git status to double-check that your working directory is clean. (note that GitHub helpfully tells you exactly what to type in the third option, e.g. find the above command in the picture above). This command has told Git that we want to connect to a remote Git repository, which we are calling origin. You will be asked to type in your GitHub username and password. (note that if you enabled two-factor authentication - 2FA - on GitHub, then you will need to generate an access token for command line use and will need to use that instead of your password). This tells Git to push all of the version information for the master branch to origin, which is the alias for the remote GitHub repository. Delta compression using up to 16 threads. Writing objects: 100% (25/25), 4.19 KiB | 0 bytes/s, done. 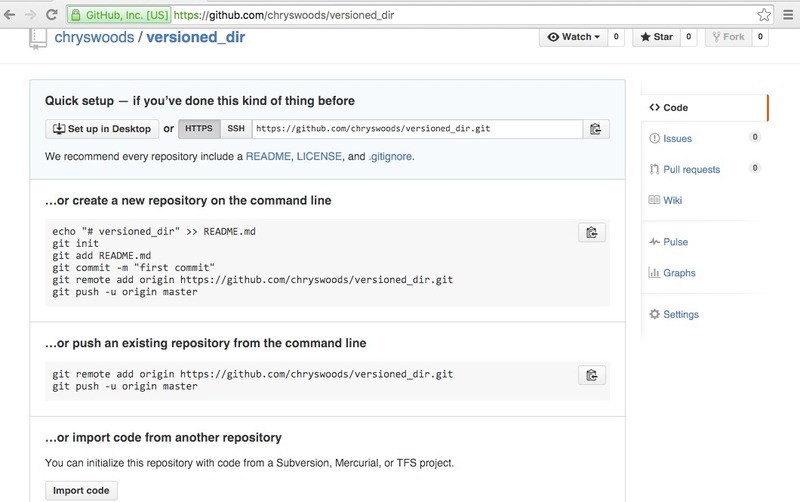 This output shows that Git has copied all of your version information for the local master branch to http://github.com/chryswoods/versioned_dir.git. The final line of output says that, in addition, there is now a new link that will ensure that our local master branch will track the remote master branch from origin (remembering that origin is just an alias for http://github.com/chryswoods/versioned_dir.git). Click on the button that says “9 commits” (in your case you may have a different number - just look for “N commits”, next to the icon that says “1 branch”). Run git status. 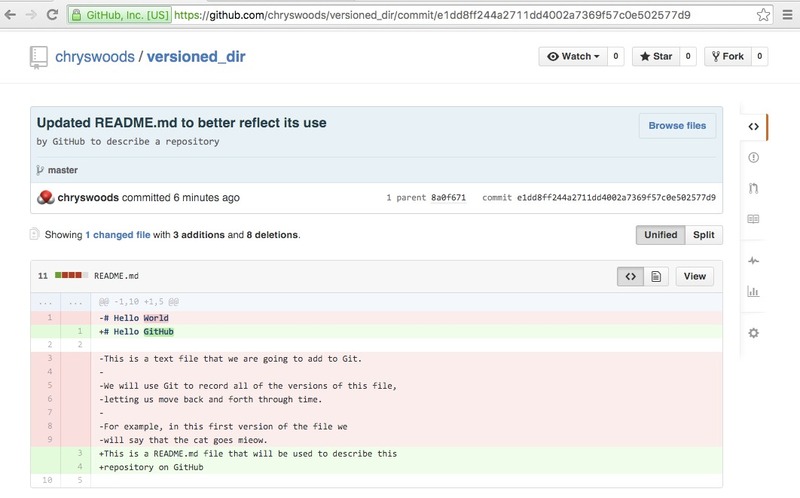 You should see that Git knows that README.MD has been modified. 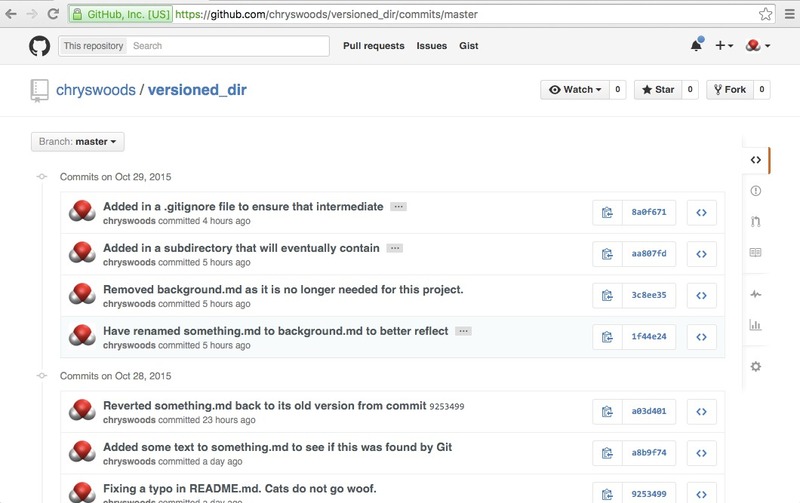 Run git commit -a to commit this modified README.MD to the local repository. Make sure you use a good commit message. Writing objects: 100% (3/3), 454 bytes | 0 bytes/s, done. 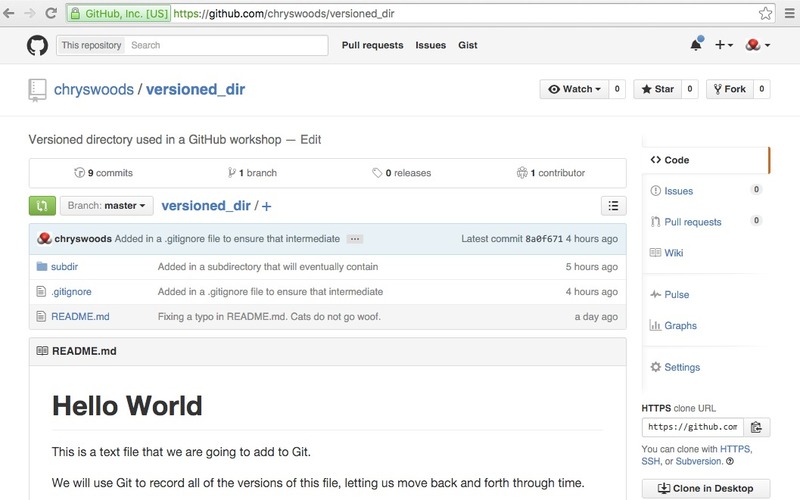 Now, reload the GitHub page for your repository in your web browser (e.g. 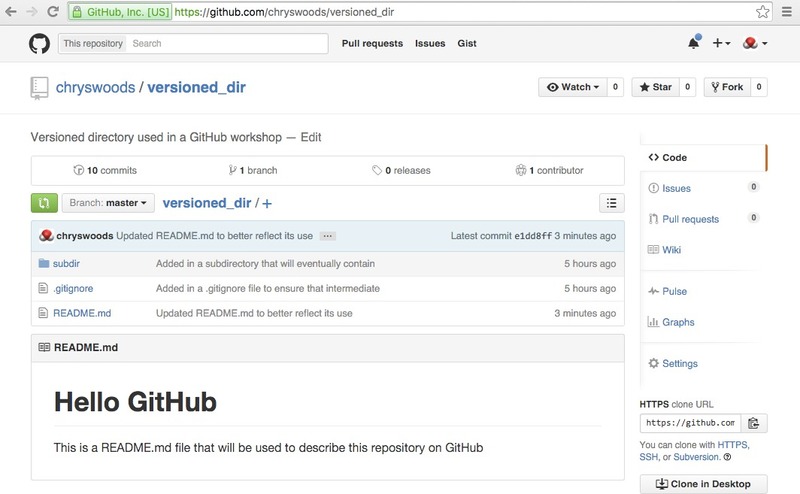 https://github.com/USERNAME/versioned_dir, where USERNAME is your GitHub username). To ensure that your local and cloud repositories are kept in sync, always ensure that you use git push after you git commit -a. NEVER push passwords or sensitive data to the repository. Make sure that you never save a password in a version controlled directory, or else you risk accidentally uploading it to the cloud. NEVER push private or unpublished research data. By pushing to a public repository you are making the file (and all its previous versions) public. Don’t push a file that you don’t have permission to publish. Don’t push sensitive or private research data. Don’t push grant proposals or research papers (at least, not before they have been awarded or published!). BE CAREFUL of offensive commit messages. It is a bad idea to be abusive or condescending in your commit messages, particularly as they will become public when you push them into a public repository. Avoid commit messages like “Fixed this annoying piece of rubbish code written by Fred”, as “Fred” is likely to see that comment once it is published. Instructions to tell git to save your GitHub username and password are available here. to tell git to save your password in memory for one hour. You can test this by typing git push, which will first ask you for your username and password. However, this will now be saved, so that if you type git push again, then you won’t need to enter the details again.